Falcon Heavy Demo Mission (c) Official SpaceX Photos, CC 0 1.0 The Falcon Heavy rocket sent to space to test reusable rocket boosters. Over the past year many amazing scientific discoveries have taken place. We got a step closer to sending humans to mars with the discovery of water on the Red Planet. To go along with the discovery of water, Space X tested the very first reusable rocket. Also, in other news we will be moving on from the kilogram and begin using the Planck constant instead. These are just a few examples of what has occurred during 2018 in the world of science. During this past summer the Italian space agency was able to find a pool of liquid water for the first time on the surface of Mars. Finding water is not the big discovery here, it is the fact that it’s a pool of liquid water. Scientists were able to use a satellite to find “…a subsurface feature spanning about 20km across under a 1.5km thick layer of ice & dust, interpreted as a buried pond of liquid water…”. Scientists already knew that there is water on the planet, however, “Due to thin atmosphere and the cooling of Mars, most of its water is locked up in ice.” This discovery is extremely important because it gives us a chance to send astronauts up there for extended periods of time. In space, astronauts need oxygen, water, and food in order to survive. There is already a way to create oxygen in space, as seen in the ISS. Also, astronauts are able to eat freeze dried food and drink recycled water. A set up similar to the ISS could be set up on Mars, but they would not be able to stay up there of too long, because of the limitations of food and water. So with the discovery of water, theoretically, astronauts would have lots more drinking water, and that water could be used to grow food. Also, in the future, if we want to send humans to permanent live on Mars without relying on Earth, the most important thing is a source of water. During February 2018, Elon Musk, and Space X were able to celebrate the success of the creating reusable rocket boosters (the big tanks the propel the spacecraft out of the atmosphere). 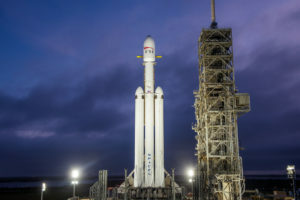 The rocket Falcon Heavy was launched on February 6, 2018, and “…two of the rocket’s three reusable boosters [were] landed safely on the ground in Florida.” The third one missed it’s landing pad and crashed into the ocean, but that is no big deal as Elon Musk said “That loss was relatively minor in the context of the launch’s overall success, though.” Failures aside, this was quite a big step forward in more accessible space travel. Everyone knows that it expensive to launch something into space. There needs to be thousands of man hours that go into making sure everyone is trained and ready for every single scenario and on top of that the cost of fuel needs in just tremendous. During the Space Shuttle program “The average cost to launch a Space Shuttle is about $450 million per mission.” That does not include the cost of making the shuttle itself: “The Space Shuttle Endeavour, the orbiter built to replace the Space Shuttle Challenger, cost approximately $1.7 billion.” In the past, for each launch, many of the parts had to remade because of the stress they went through during takeoff. The rocket boosters for example, would just fall off once they emptied, and plummet down to Earth. So by creating a reusable parts, companies are able to save millions of dollars, thus allowing more frequent trips to space. With each trip, we learn more about what thrives outside of our atmosphere, and come closer to possibly moving to a different planet. 2019 was going to be a momentous year for the kilogram, as it was going to turn 130 years old. If you noticed I said was. That is because in November 2018 “the International Bureau of Weights and Measures, which regulates the metric system, will gather in Versailles and vote to replace this physical artifact with a definition of the kilogram based on a fundamental constant of nature.” The International Bureau of Weights and Measures or BIPM for short (yes, this is a real organization) has decided to retire the physical representation of a kilogram and replace it with a more accurate and constant standard, which happens to be ” a complex physics formula called “Planck’s constant.””. So how do you end up retiring something that has been used for over a century. Well the BIPM does actually have a proper reason. The old kilogram, which was called the Grand K, was a real object, so any small debris could alter its value. So by replacing it with formula, the value of a kilogram will never change. So, you may wonder how does this affect you? Well it does not, “…a kilo is fine for weighing things like potatoes, where extreme exactness is not necessary.” So in the real world no one will know the difference, but those doing complicated experiments in labs will, because they need to be as precise as possible. In 2018 we took many steps forward in the world of science, many in astronomy with discoveries on planets abroad, and more efficient ways to get there. Also, 2018 brought an end to the 129 year old artifact know the the Grand K, or the kilogram. All in all, 2018 was an amazing year for science.